September 10, 2018 (Henrietta, NY) ─ Seniors at Woodcrest Commons have been soaking up the last weeks of summer with road trips near and far. Residents from the DePaul Senior Living Community in Henrietta recently enjoyed a trip to Skaneateles for ice cream at the Skan-Ellus Drive In, as well as a picnic at Mendon Ponds Park in Rochester. After taking a boat tour in Skaneateles last summer, residents decided to head back to the quaint village for a taste of the retro-vibe at the Skan-Ellus Drive In and a visit to Lockwood Lavender Farm. 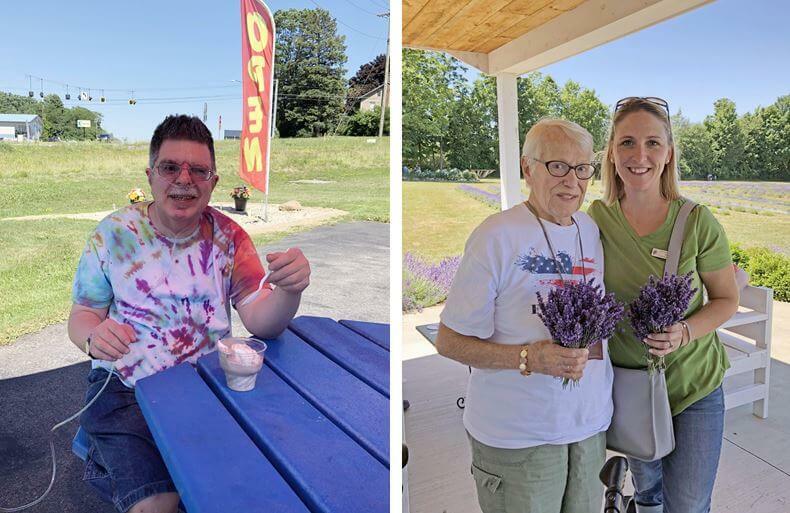 Pictured above, Doug Kurlan enjoys some ice cream at Reese’s Dairy Bar while Norene Hogan and Woodcrest Commons Marketing Director Tanya Passarell collect bouquets of fresh lavender. Residents also enjoyed a stop at a local boat launch, a drive along West Lake Road to check out some beautiful lake homes, and a detour to Reese’s Dairy Bar for dessert. 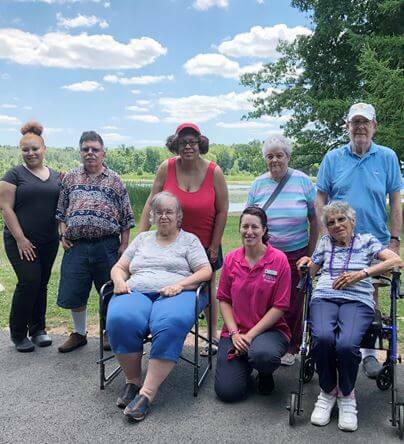 In addition, Woodcrest Commons enjoyed a picnic at Mendon Ponds along with residents from Horizons, a DePaul Senior Living Community in Canandaigua. There they enjoyed peace, tranquility and watching butterflies flirt with warm breezes. They even paid a visit to the Monroe County Sherriff’s Mounted Patrol Horse Barn. Pictured above (back row, left to right) are Woodcrest Commons staff member Lydia Colon, Woodcrest Commons residents Doug Kurlan, Andrea Heath, Horizons resident Shirley Carr, Woodcrest Commons resident Jack Milligan, (front row, left to right) Horizon resident Susan Stewart, Activities Director Sarah Mason and resident Garda Houston. For more information about Woodcrest Commons, please contact Administrator Kathy Murray-McGhan at (585) 334-1800, at kmurray-mcghan@depaul.org or visit us on Facebook.